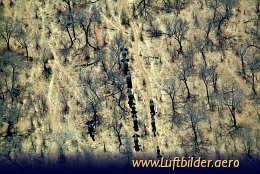 Elephants in the Chobe National Park on their way to the river. Most of the Botswana Elephant population lives around the Chobe River. 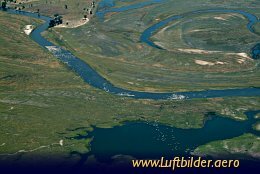 The Chobe River National Park is the boarder between Botswana and the Caprivi strip, which belongs to Namibia. The Caprivi Strip was named after the German Chancellor Leo von Caprivi, who negotiated the land in 1890 with the United Kingdom. It was part of the Helgoland-Zansibar treaty. 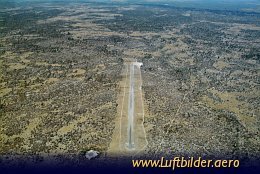 The Chobe Airstrip, with the runways 12/30 is 1000m long and 18m wide. Its operated by the Okavango Wilderness Safaris. In order to land there prior permissions is required. The strip can easily be found. The route passes over Hippo pools in the Khwai/Xakanaka flood plains.